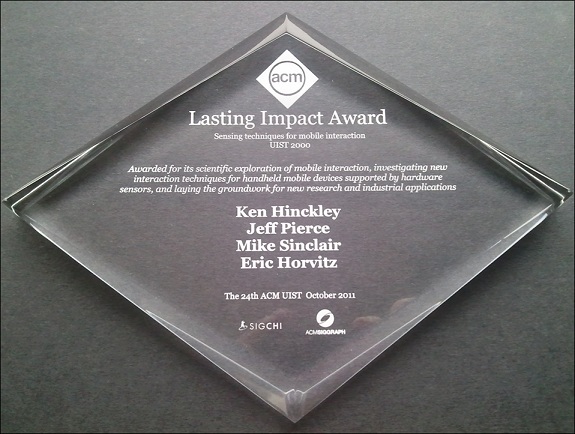 Lasting Impact Award, for Sensing Techniques for Mobile Interaction, UIST 2000. “Awarded for its scientific exploration of mobile interaction, investigating new interaction techniques for handheld mobile devices supported by hardware sensors, and laying the groundwork for new research and industrial applications.” Awarded to Ken Hinckley, Jeff Pierce, Mike Sinclair, and Eric Horvitz at the 24th ACM UIST October 2011 (Sponsored by the ACM, SIGCHI, and SIGGRAPH). October 18, 2011. Check out the original paper or watch the video appended below.